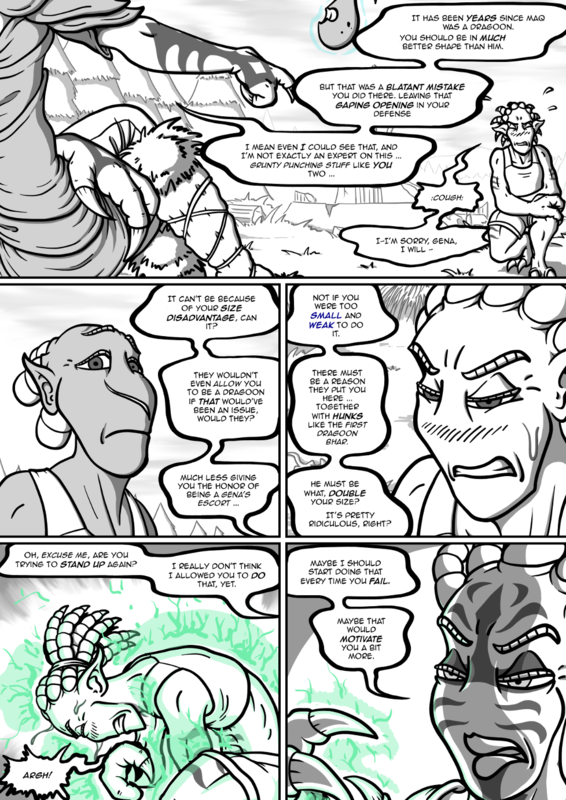 A Fantasy Webcomic – Updates Sundays! For panel 4 I tried to find a color that I fits the best for pain magic but also doesn’t look like anything else (yellow would’ve looked like actual lightning, I already use blue a lot for telecinesis and misc stuff etc.). So what I ended up with was … mint green. I’m not sure it works as well as it should. Ki'i'Mar: Not if you were too SMALL and WEAK to do it. There must be a reason they put you here ... together with HUNKS like the FIRST DRAGOON BHAR. He must be what, DOUBLE your size? It's pretty ridiculous, right? Ki'i'Mar: Oh, EXCUSE ME, are you trying to STAND UP again? I really don't think I allowed you to DO that, yet. Ki'i'Mar: Maybe I should start doing that every time you FAIL. Maybe that would MOTIVATE you a bit more. If you like my comic, vote for me on topwebcomics.com!